We are chuffed to bits to host a Birthday bash for Cal and Sarah at West Lothian Guitar Services so come join the fun and dancin. Tickets £5. 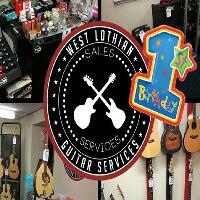 We are chuffed to bits to host a Birthday bash for Cal and Sarah at West Lothian Guitar Services. Its going to be a Rockin and Rolling Night with UNCLE RED PROVIDING the Live entertainment. Tickets for General Entry are £5 either ONLINE or ON THE DOOR. Invites only available from WLGS. MUSIC ~ DANCIN ~ PRIZE GIVEAWAY. ROCK CLUB ACTION follows when the live session wraps up at approx 11pm thro till 3am as normal.